Mrs Dennison is leading School Council this year. Each class has chosen their class representatives and the children have been busy working on promoting the Shoebox Appeal. Come back to this page soon to find out who is in the school council team and what other plans they have in mind! Here we are with one of our Governors (Anne Clark) and Cllr Suzie Mercer, proudly viewing the defibrillator in its home. 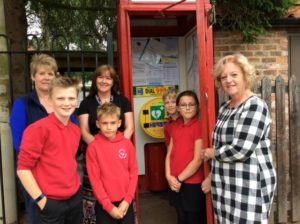 School Council worked hard together to raise funds for a defibrillator in the village. They held cake stalls, collected money in buckets and generally raised awareness of this cause. Waitrose even chose us to be a Charity of the Month, so raising more money. They were then able to complete this project, with the help of a very generous grant from Wheldrake Ward Committee. The School Council presented a cheque to the Village Council at our Songs around the Christmas Tree event in December. The defib. is in the old telephone box just outside school. We had hoped we would never have to use it, but it has helped to save a life and we are glad we could help to make our village a safer place. Here we are trying to decide where to put the scooter pods. We ran a healthy ‘Tuck Shop’ on a break time. We charged 10p to 30p for items and it was a great way of raising funds, keeping us healthy and giving us a bit more energy to do our work! So win, win! 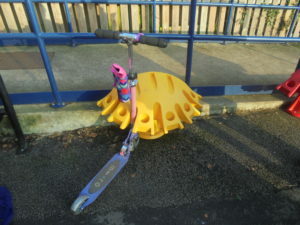 We also chose a new scooter pod to park our scooters in, after winning the CYC ‘Scoot to School’ Competition in Walk to School Week. Here is the one of the pods in use! 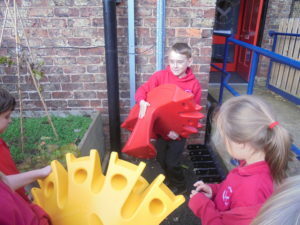 We decided on a red and yellow pod because that will be bright and cheerful, just like our school. We worked closely with Christine Packer from CYC to improve parking and traffic around school. For example, we asked children in school to design posters to alert motorists to the 20mph speed limit near school and we led an assembly to tell school about this. 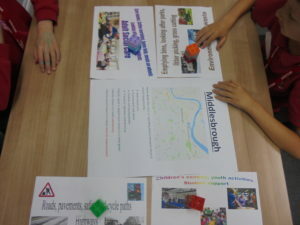 We also took part in the City of York School Council event called Primary Voices, at West Offices. Here we joined pupils from seventeen other York schools and local councillors too to discuss our visions for the future of the city. It is good to think that our voices are being heard by the people leading our city.